Child-friendly?Invictus tells the true story of how South African President Nelson Mandela used rugby to help unite his post-apartheid country. The film’s PG-13 rating is mostly for language, but understanding the context and message of the movie would be difficult for young children as well. It is recommended for kids aged 13 and older. Invictus chronicles the story of how Nelson Mandela joined forces with the captain of the country’s all-white rugby team to unite post-apartheid South Africa. It starts as Mandela takes office as the newly elected president of the country and realizes the great economic and racial divide left in the wake of apartheid. He befriends the rugby team’s captain, Francois Pienaar, and encourages him to win the 1995 World Cup in an effort to give both black and white South Africans something to rally around together. The film is directed by Hollywood legend Clint Eastwood and has two big-name stars playing the two main characters – Morgan Freeman as Mandela and Matt Damon as Pienaar. At over two hours long, Invictus may not hold the attention of some kids. 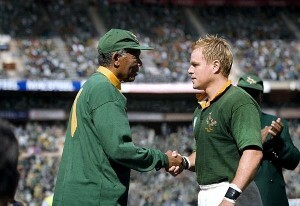 Since the movie focuses on rugby as the force to unite the country, there are a lot of scenes with the sport in them. This is the most violent part of the movie, since rugby is a very physically aggressive game. There is also some bad language with members of the team occasionally swearing. While fathers may need to explain the background of the South African history to children before seeing the film, it will most likely provide kids with a great lesson. Mandela and Pienaar also served as positive role models in the film by looking beyond race during a time when it was a main focus.